A Camera-trap captures the local wild life. A camera trap captures a variety of local wild life using a fallen tree over a river as a bridge. Wildlife artist Jean Chevallier, 57, set up the camera at the beauty spot throughout 2018 near his home in the Champagne region of France so that he could observe the creatures. 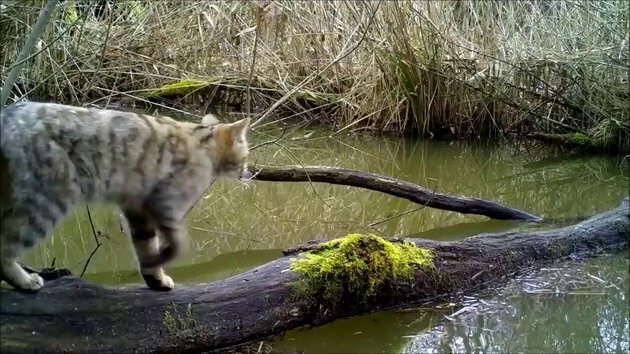 Animals caught on camera include Wild cat(s), fox, polecat, pine marten, weasel, raccoon, badger, wild boar, bank vole, wood mouse, harvest mouse (probably) hazel dormouse (possible) shrew (pb common, or pygmy) coypu,, grass snake and a few birds. I wonder in what time frame that was taken. What a variety of wildlife! Very nice video, cameramaster! Yes nice selection of wild beasties there. At the end it says that this is a summary of the year 2018. The snake was probably my favorite. #3 Thanks, had not seen that! Very cool. Nice find cameramaster. I also focused on the water level. Is it close to the ocean?